Cesar Milan’s Basic Dog Biscuits: You may have seen Milan rehabilitating dogs on the television show Dog Whisperer. 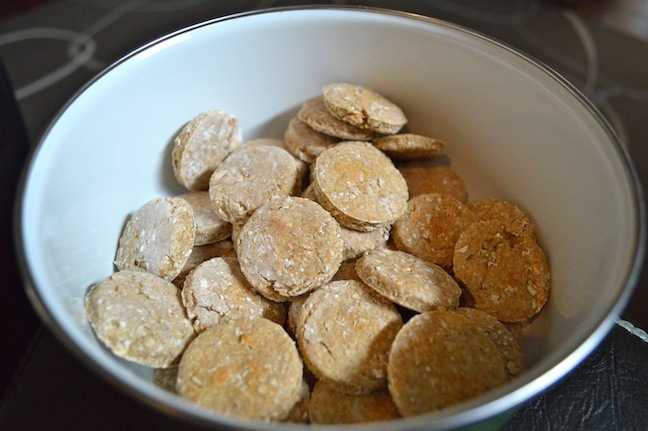 He lists several treats on his website, but our go-to is his basic dog biscuits. They probably take less time to make than your favorite cookies and you include only oatmeal if your dog is sensitive to flour. Alton Brown’s Stinkin’ Dog Treats: This Food Network star has perfected nearly every recipe on the planet. We were tickled when we found he also created a treat for Fido. Beware, for they are slightly stinky just as their name implies. Sardines and fish sauce lend an interesting flavor and aroma your dog will love even if you wrinkle your nose. Plus, they add nutrition. Joy the Baker’s Chewy Cat Treats for Cats: Cats can enjoy homemade treats too! This post is Joy’s edible ode to her cat upon turning two-years old. It’s so moving it may bring happy tears to any cat owner’s eyes. This recipe is vet approved too, since it’s recommended by a Veteranarian Clinic in Virginia. As always, consult with your veteranarian with questions about your dog’s specific nutritional needs. He or she will be able to advise you what homemade treats are best for your pet. As your resource for pet boarding in Melbourne, FL, we take your dog’s health seriously. Contact us for information about our cage-free boarding options. We care for dogs, cats, and other small animals.